On Okinawa's battlefield where every frontline infantryman was a hero in his own right and the miraculous was common place, the name of Sgt. Clem Lane Jr., of 115 Wheeler St., stands out because of his skill and cool courage in the campaign , according to a dispatch from the Seventh Infantry Division on Okinawa. His feats are rehashed at the bull sessions, according to the dispatch, and his modesty is attested by the revelation in the story that he has been wounded and received the Purple Heart & has never mentioned the fact in his letters to his parents. Sergeant Lane was a member of a mortar unit of the Seventh Division which was bearing the brunt of the greatest attack the japs have staged since the start of the Pacific war. Jap artillery and mortar shells were falling as never before and the enemy was massing for a smashing banzai attack at dawn. Held to the ground by shell fire, the Yanks seemed in a hopeless position. But the Lane boy who used to tote the pigskin for Sumner County High School Purple Panthers had an idea. Leaping from his foxhole, he sprinted through the shrapnel to the crest of a ridge where he had perfect view of the charging Japs. From this point he directed the fire of his mortars until the attack was broken. With shells only 50 feet ahead one of the frontline riflemen declared "The Nips were that close and thats where they would do the most good and thats where that Tennessean put them. It sure did the job." They say it was the mortar fire that stemmed the tide. Sergeant Lane entered the Army in November of 1942 and has fought with the veteran Seventh Division thru the Kawajalein, and Leyte campaigns. He was wounded early in the Okinawa campaign but returned to his duties as squad leader in a short time. 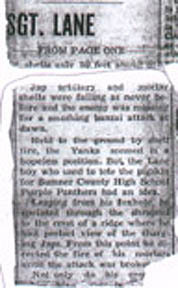 Newspaper Article: Publication date 25 June 1945. 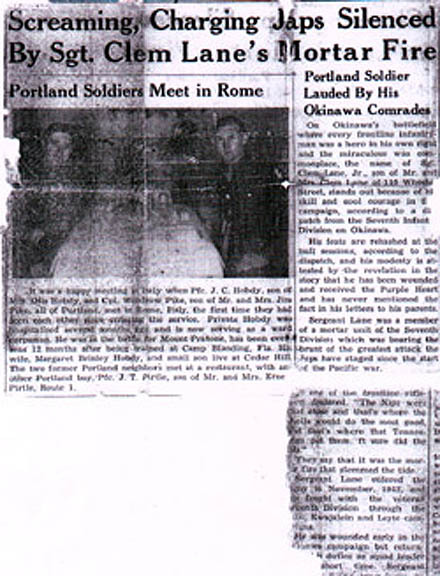 The story is re-printed here on World War II Stories -- In Their Own Words with the kind permission of the the Son of Mr. Clem Lane, Jr., Mr. Mike Lane. Our sincerest THANKS allowing us to share some of their stories. Original Story submitted on 11 April 2004. Story added to website on 13 April 2004.